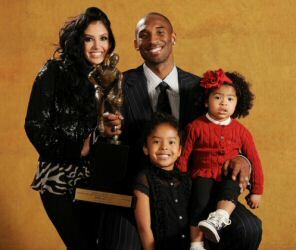 Kobe Bryant’s wife has filed for divorce from LA Lakers star yesterday citing “irreconcilable differences”. Vanessa Bryant, 29 , who stuck by Kobe, 33, after he was charged with sexually assaulting a Colorado woman in 2003 – has been married to the basketball star for ten years. TMZ reports that the couple has no pre-nuptial agreement, so Vanessa Bryant will be entitled to substantial monies, and has requested spousal support. Vanessa and Kobe Bryant met when she was just 19, and he 23, and she was working as a backing dancer in a studio where he was recording. TMZ reports that according to the legal documents, Vanessa Bryant is asking for joint custody of their two daughters – Natalia, 8, and Gianna, 5. However, the mother is asking that Kobe Bryant get visitation rights, which means she wants the kids in her care most of the time. Vanessa Bryant is being represented by Wasser and attorney Samantha Klein, her clients include Britney Spears, Angelina Jolie, Maria Shriver and Kim Kardashian. Kobe Bryant went to the Jay-Z concert Tuesday night in Los Angeles without his wife, and he looked miserable. She signed the divorce petition on December 1 and Kobe Bryant signed his response on December 7. Kobe Bryant gave her a $4 million diamond ring after the 2003 scandal, which she will be able to keep. At the time, they released a joint statement saying they have “resolved all issues” privately, with the assistance of counsel. In 2003, hotel employee Katelyn Faber of The Lodge and Spa at Cordillera in Eagle County said Kobe Bryant raped her after he checked into the establishment to await knee surgery. Kobe Bryant admitted an adulterous sexual encounter with his accuser, but denied her sexual assault allegation. In September 2004, the assault case was dropped by prosecutors after Katelyn Faber refused to testify in the trial. Katelyn Faber filed a separate civil lawsuit against Kobe Bryant, which the two sides ultimately settled with the specific terms of the settlement being undisclosed to the public.